Have you ever asked about what does a VPN stands for? If you haven’t then you should know about it. VPN stands for “Virtual Private Network“, which is created to protect the Internet user from all online threats. If you are worried about the Google, Youtube, and websites that are created to steal your information then you should go for VPN. VPN keeps the Google trackers, Hackers, and other privacy-invading threats away from you. I hope that you have fully understood the concept. However, I understand that you are normal JOE, who needs an example to understand and how to use it then read the Rocket VPN Review, which will clear all of your doubts and misconceptions. It is important to read VPN Reviews before buying a VPN on a review site like Anonymster. 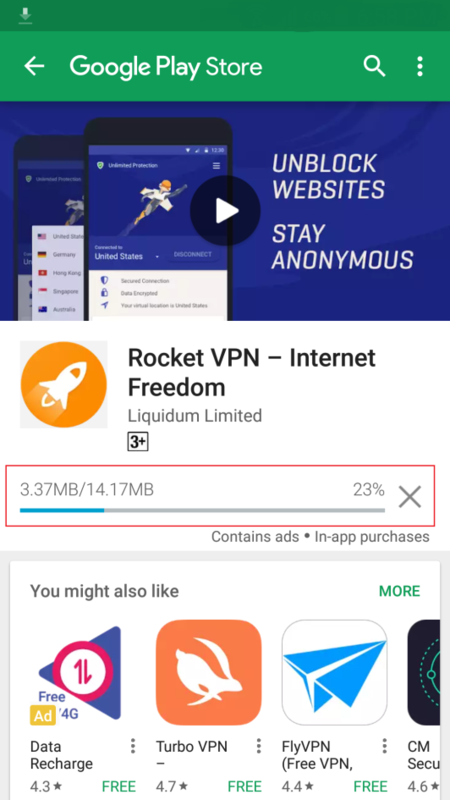 Rocket VPN is an Android app, which has developed by hotspot shield, who are reputed in the industry. Do not worry Rocket VPN supports both Android and iOS devices. Their app file size is 14MB and you can estimate the size after installation. The Rocket VPN does not consume your internal storage but that’s the real concern. In many cases, we have seen the app on Google Play Store may seem less after the download but they when you use them in real-time, they consume a lot of RAM, which can slow down your Android smartphone but that’s not going to happen in the Rocket VPN case. The app does not drain your battery life and it consumes reasonable RAM, which ensures that you are not decreasing your smartphone battery life. You can run the app smoothly in the background and multitask without any lag. Selecting a primary VPN is the most difficult one for any user because every VPN comes with a catch such as Sign up’s, Login, and more. You will find tons of apps on the play store, who offer free apps and then they put restrictions like “Buy to use this feature” etc. 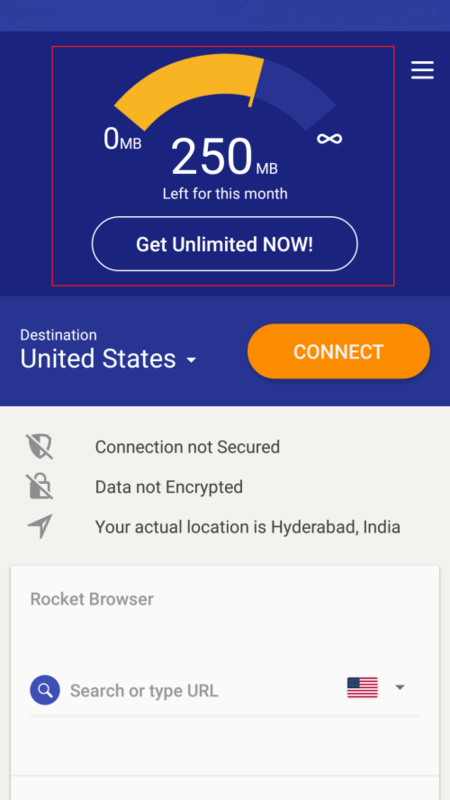 Rocket VPN does come with a limit of 250MB a month, which is more than enough for browsing. I consider the data transfer speed crucial because most of the reputed apps fail to provide speed due to heavy traffic. Security is important, but without speed, you have no choice but to exit the app. Let’s assume that if your Internet pack gives you 1MB/Sec, but after enabling the VPN if the speed couldn’t even reach 500KBPS/Sec then you are probably wasting your time. So we thought we should compare the speed as well or else it will be a total waste of data and time. After several tests before and after, the results were close to the screenshots. There isn’t much difference you can tell by looking at the both screenshots. 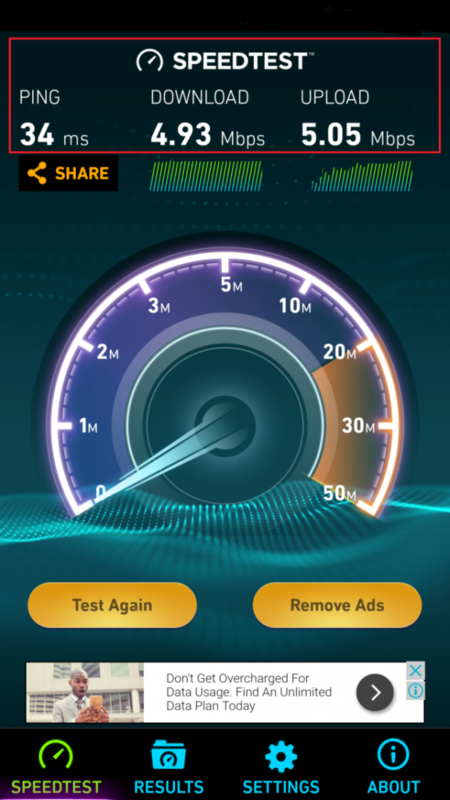 The download Speed & Upload is approximately similar to the previous tests. Yes, Rocket VPN needs your support in running the services smoothly, and they do provide paid version of it at an affordable price. The security, services and there will be no limit to the usage after you opt for the paid version. If you plan to go for the one year plan, then the price will be $2/Month, which is the lowest cost you can ever get. In case, if you opt for the three months or 6 months plans then the cost would eventually be higher. The dealbreaker plan is the $2/Month plan, after calculating $24/year, which is affordable when compared to the other VPN’s. 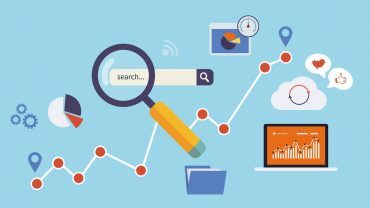 The Rocket VPN provides you free-VPN services which does cost them a lot of capital to run smoothly and they generate that revenue from the ADS. You may see short ADS in the app and occasionally full screen ads will pop-up on your screen.